His voice was soft. A melancholy caress. He lifted his chin when understanding dawned on her face. So, I've been anticipating this book since last year. 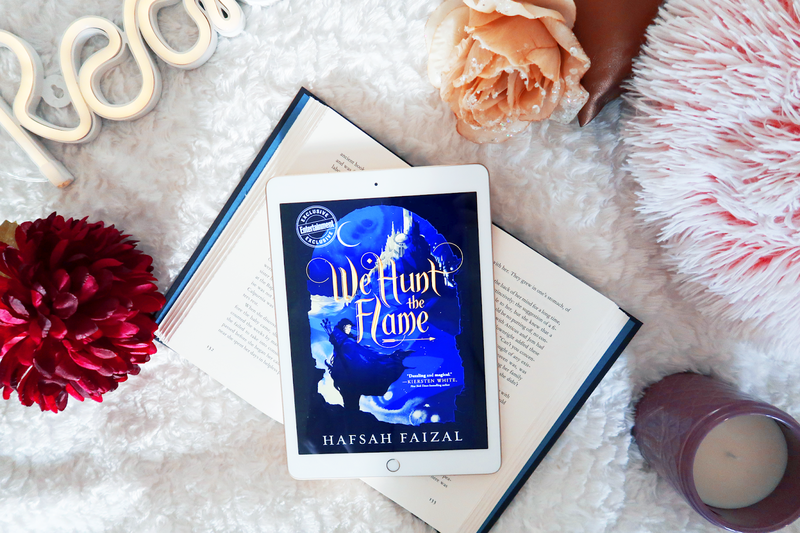 Of course We Hunt the Flame took a spot on my Most Anticipated of 2019 list, because I was just so excited to read it. Now, let me tell you guys, for all the expectations I had of this book, it did NOT disappoint one bit. The premise of this book is very compelling and immediately made me fall in love with the concept of this novel. We Hunt the Flame is set in a world that is inspired by ancient Arabia, and follows the huntress Zafira. Zafira is infamous for being the only hunter to brave the Arz forest, but, the people of Arawiya don't know her identity, and they certainly don't know their hunter in fact a woman. Her caliphate is suffering, so Zafira sets out on her most important hunt yet; to discover an ancient artifact to restore magic to her kingdom as was once before. However, the assassin Nasir (also dubbed the Prince of Death) is tasked to assassinate everyone who gets in the way of his father, the leader of Arawiya. When Nasir is told by his father to kill the hunter and retrieve the same artifact, intrigue, danger, (and maybe even romance) ensues! What did I think of We Hunt the Flame? Okay, so I can't say my expectations for this book weren't on the higher side. The premise sounded AMAZING. I used to dislike the enemies to lovers trope, unless done well (which this 100% was! ), but I've recently been warming up to it. The setting of this also sounded super intriguing, I tend to love Arabia inspired fantasies and since this is an own voices novel, I trusted it would be done right. The world-building is so intricately done that it's hard to put the book down from the very first chapter. Anyway, guess what? This book was amazing. "All right is when you're bleeding black, but it's not as bad as bleeding red. When the world crashes, but you're not alone when it does. When the darkness is absolute, but you hunt down the smallest flame and coax it brighter. When you carve the good out of every bad and claim it a victory." As for the plot, We Hunt the Flame did everything it promised to do! The story was filled with excitement, plot-twists, and well-developed character moments. All of the plot-twists were surprising, and out-of-the blue, which is something I appreciate when it comes to a good book. I really enjoyed the story-telling from a dual POV because it helped the reader to get to know both these characters better. Also wanna quickly say I loved how fast-paced this was, you guys know how I feel about slow books, but this was not at all dragging in any way. I devoured the whole book in (almost) one sitting! And, ugh, THAT ENDING! Cliffhangers are torture but I love them. To come back to the characters, let me just say that both the protagonists (and their relationship) stole my whole heart. Nasir, oh boy, Nasir; this guy has amazing development and is such a multi-layered and complex character. He is one of the morally-grey variety, which a lot of authors gravitate towards nowadays and has become a popular trope in YA lit, but Nasir can in no way be roped in with the cliches. Zafira, too, was such a compelling female protagonist; empowering, independent, and brave, but also very human and relatable. She lives in a patriarchal world but doesn't conform to any of its standards. She is a really inspiring character, and I loved both of them. When it comes to the romantic subplot, Hafsah did not rush their relationship at all, which I really appreciate. It made Nasir and Zafira's scenes very special to read and resulted in a lot of beautiful quotes when it came to their relationship. I ship them so much, you guys, their dynamic is so interesting and I do love myself a good slow-burn romance most of the time! I really can't wait to see where their relationship goes in the next one. In conclusion, We Hunt The Flame genuinely made me feel so happy. I love diverse reads like this, especially when most of the Young Adult Fantasy genre is still set in Eurocentric universes. We Hunt the Flame marks a very very strong and refreshing debut novel and I can't wait to read the next book in this series. This book is a solid five star read and I can't wait to see what it does when it's out in the world! Such a gem. Thank you to Hafsah Faizal and Macmillan for providing a Review Copy!